There’s no questioning the fact that with every passing day there are many changes that occur; be it increased knowledge, getting weaker bones or aging. Of all the changes that occur, aging is the most visible sign of it all. Aging can start as early as when you are twenty. The early aging signs are very unnoticeable and not bothering to many of us, they do not take away your charm so soon after all. The time your skin starts aging depends on many factors like your environment, your genetics and even the type of makeup you apply. So, the question is, when do you know that you’re aging? Sun spots are the result of excessive sun exposure. We all love being in the sun especially when we are in our twenties. The excessive exposure during the younger years is the major cause of sun spots, sooner or later in life. According to scientists, if these sun spots are visible anytime between your twenties and thirties, it is a matter of serious concern. It is the time of life when the collagen production is high and the skin is healthy. Due to aging, the cell turnover rate decreases and the top most layer of the skin starts becoming dull and lifeless. 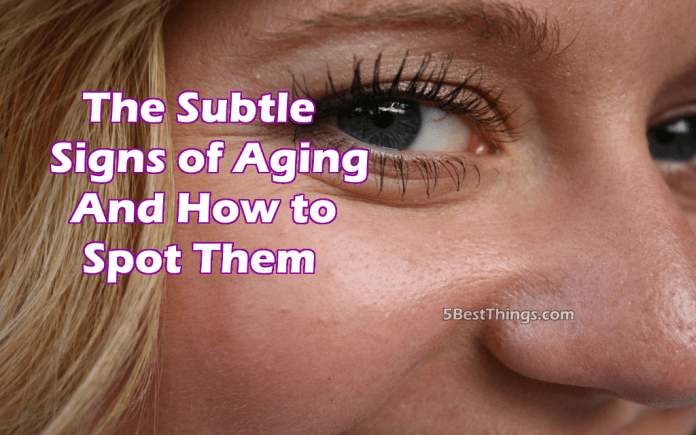 The younger glow of the skin depletes and it starts to look older. Many things can cause dryness, but it is one of the most common aging signs. The heat and the type of environment we live in today are very harsh for the skin. All the moisture of the skin is pulled out during the day, leaving it dry and hence causing aging. Skin under the eyes is very thin. Further, it gets thin due to the aging process. This causes the dark circles and the puffiness of the eyes to become more prominent. The main causes of dark circles are lack of sleep, late night schedules, excessive salt and alcohol. Collagen and elastin provide structure to our face and help the skin to stay firm and plump during the younger age. Their production slows down in the late twenties and hence makes the skin look loose and less taut, especially near the jaw and cheeks. More popularly known as the laughter lines, crow’s feet are the tiny lines that start forming around the eyes and look like the feet of a bird. They start emerging in the mid-twenties because of the reduced production of collagen and elastin. The skin near the eyes is very thin and has very less oil producing glands, which hinders the capacity of the skin to moisturize itself naturally. It is mainly caused due to excessive sun exposure and repetitive facial expressions like smiling, laughing and squinting. The creases, folds and fine lines formed on the skin, as you age, are known as wrinkles. These are also the effects of damaged collagen and elastin. The skin starts getting thinner and loses its oil-producing capacity, hence leaving the skin dry and exposed to further damage. The skin around the neck starts developing vertical ridges due to the separation of platysma, the muscular bands. This is due to the lost skin elasticity and diminishing softness of fatty tissues around the neck area. They are more visible when you speak. The elasticity of the skin reduces with the years and they give in to gravity, leaving the ear lobes loose and wobbly. It starts early if one wears heavy chandelier earrings regularly. Fat starts diminishing at the back of your hands with age. The muscle tissues also weaken up causing the veins and the tendons of the hand visible. As the quotation rightly says, the need of looking good is always on a woman’s mind. And yes, these signs of aging can be slowed down. After all who minds a prolonged youthfulness? Here are a few ways in which these signs of aging can be slowed down, if not reversed. Sunscreen is a sure shot secret of a prolonged youth. Skin is very delicate and the sun can damage your skin beyond repair and its UV rays can also be the main cause of cancer. A good sunscreen with a broad spectrum can help in preventing this damage. This helps in avoiding the sun spots and early wrinkles. Revitol anti aging treatment serum is a miracle as it helps in vanishing the fine lines and wrinkles in seconds. It is a formula that helps to hide and repair the wrinkles and is very effective. Daily use of similar products can help you look younger for a longer time. The key protein to help and promote elasticity of the skin is, collagen. After a certain age, skin starts losing collagen and appears very loose. To help the loss of collagen, it is highly recommended to use a moisturizer that is rich in collagen. This will help your skin to cope with the loss and will leave your skin looking younger and firmer. Retinoid helps firming the skin around the eyes and it also avoids those unwanted crow’s-feet and fine lines around the thin eye skin. Retinoid also help the skin to look clearer, softer, brighter and less lined. Many skin specialists are prescribing them for aging and other skin related problems. Vitamin C is rich in ascorbic acid that helps to make your skin look younger and firmer. It also helps in reducing uneven skin tone significantly. Ascorbic acid also helps skin’s surface rebuff and assists in reducing external stressors and skin exposure to such similar elements. There are many skin care products that use Vitamin C as their key ingredient. These products can be of great help from aging skin. Moisturizers helps to lock in water in your dull and aging skin. Constant use of moisturizer heals the dry and flaky skin and makes your skin look replenished and bright. It also brings glow to your dull skin, if used regularly. Moisturizers should be used for all – your face, body and lips. Water is the best for any skin related problems. It helps your skin to look hydrated by removing all the toxins from it. Water should be taken very frequently as it helps your skin keep firm for longer. Hydration in early years will show its effect later in life also. Fruits are rich in anti-oxidants. They help in defending the skin against damaging free radicals. Fruits also give the skin a natural glow that goes a great way in life. A person who has a fruit rich diet looks much younger than the people who don’t. Eating tropical fruits that are rich in Vitamin C, help to replenish your skin’s stores. Tobacco has toxins that can lead to a dull face, premature aging, leathery skin, dry complexion, premature lines and wrinkles. It is generally also known as a smoker’s face. Smoking not only gives your skin an unhealthy outer appearance, but also destroys the deeper layers of the skin. Sleep gives time for your skin to replenish and restore itself naturally. It is very important to take 8-9 hours of sleep every day. There are many beauty products that are available nowadays that fasten up the restoring and replenishing process. They are popularly known as the night creams and almost every brand has its own night cream available. These are indeed really good for the aging skin, as they work together with the natural restoring process and enhance it. Burns are not only caused due to sun. The heaters, fireplaces and other such light sources also cause burns. A direct exposure from two to three feet can cause redness and breakdown of collagen, according to skin experts. This can lead to premature aging as well. Serums work as a miracle to hide those thin lines and wrinkles at an older age, however, they can also be the main reason for your prematurely aging skin. At twenties, your skin is firm and has the capability to renew the destroyed collagen. But with the use of serums, this capability can be lost much earlier in life. Serums have active ingredients which increase the rate of metabolism of cells. This leads to skin breakout as the young skin is already active in this rate of metabolism. Now that you know the signs of aging and the ways you can avoid it, treat your skin well. A younger looking skin is always a plus to your personality. Glow your way on, women!